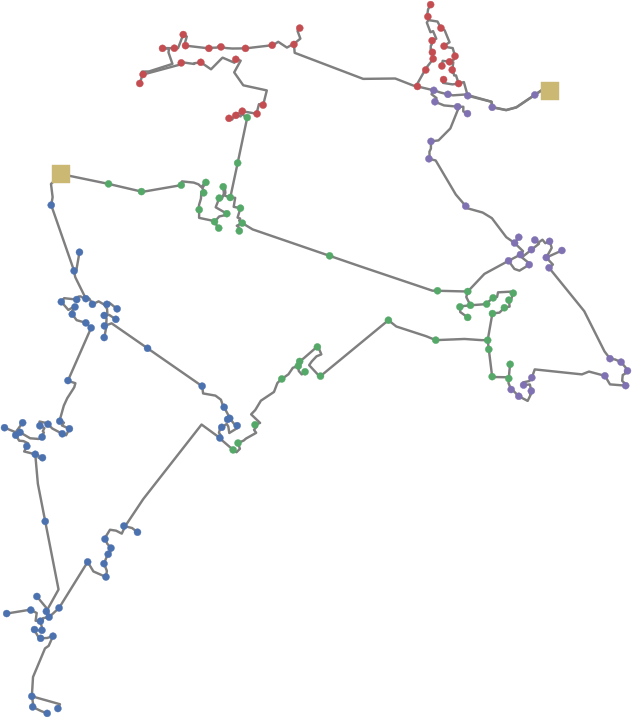 The MV Oberrhein network is a generic network assembled from openly available data supplemented with parameters based on experience. Loads the Oberrhein network, a generic 20 kV network serviced by two 25 MVA HV/MV transformer stations. The network supplies 141 MV/LV substations and 6 MV loads through four MV feeders. The network layout is meshed, but the network is operated as a radial network with 6 open sectioning points. The network can be loaded with two different worst case scenarios for load and generation, which are defined by scaling factors for loads / generators as well as tap positions of the HV/MV transformers. These worst case scenarios are a good starting point for working with this network, but you are of course free to parametrize the network for your use case. The network also includes geographical information of lines and buses for plotting. The different colors of the MV/LV stations indicate the feeders which are galvanically seperated by open switches. If you are interested in how to make plots such as these, check out the pandapower tutorial on plotting. As you can see, the network is designed to comply with a voltage band of 0.975 < u < 1.03 and line loading of <60 % in the high load case (for n-1 security) and <100% in the low load case.